Omega has launched the New Seamester Aqua Terra Collection for ladies worldwide today. 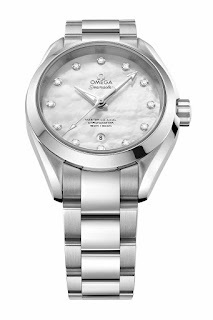 The OMEGA Seamaster Aqua Terra 150M Ladies’ Collection with distinct sizes, materials and colors offers plenty of variety for women who adore choice. The dials are made from pearled mother-of-pearl, which provides a soft, tranquil effect. In most instances, the mother-of-pearl is white, however OMEGA has also introduced Tahiti, lavender and coral which are all instantly captivating. 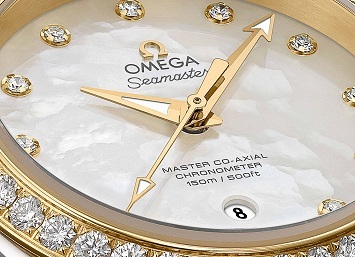 Every dial of the Aqua Terra collection also includes a series of diamond indexes. Diamonds are also used to pave the bezels of numerous models which deliver added radiance, while the overall look is completed by a metal bracelet or leather strap. The new collection will be available soon in Pakistan at all AM:PM by Collectibles outlets. AM:PM is another master piece for the luxury industry in Pakistan. It is the idea of the company known as Sonraj which had previously launched the famous watch boutique "Collectibles".